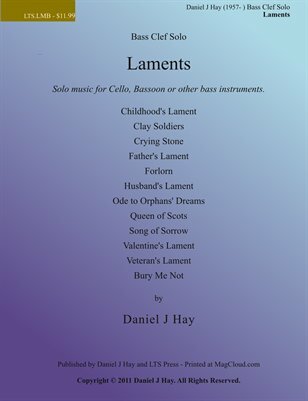 A collection of Laments by Daniel J Hay for solo instruments. This volume is for bass clef instruments and there is a volume for treble clef instruments as well. Includes: Childhood's Lament, Clay Soldiers, Crying Stone, Father's Lament, Forlorn, Husband's Lament, Ode to Orphans' Dreams, Queen of Scots, Song of Sorrow, Valentine's Lament, Veteran's Lament, Bury Me Not.